At my first National Council of Teachers of English (NCTE) convention, I found myself surrounded by celebrities – at least in the world of literacy. Franki Sibberson and Troy Hicks were presenting on the topics of technology-enhanced reading. Paul Hankins was seated behind me. Lee Ann Spillane was sitting next to me. As Franki and Troy presented, I was impressed with my neighbors’ listening skills, considering how connected they are online. Paul was a great conversationalist when we had the chance to talk with a neighbor. Lee Ann had a blank sketchbook out, synthesizing the information through writing and drawing. Following her lead, I put my laptop down, shut off Twitter on my tablet, grabbed my stylus and opened up Penultimate on my iPad Air. My first tries were more text than visuals and pretty concrete (click here and here to see my initial attempts). I thought back to how Lee Ann visualized the metaphors evoked in the presentations. My final visual notes better captured my thinking, this time during Steven Layne’s presentation on reading aloud. For example, I drew a road around the phrase “Know where the text is going”. My visual notes of this topic made it more understandable and memorable for me. Limiting myself to primary colors helped to keep things simple. Visual notetaking allowed me be less of a Twitter transcriptionist and more of a learner – all thanks to where I sat. On the eve of the summer, I posted about four middle level books that I had planned on reading during my time away from the office. I think it is important that all educators who teach and promote literacy know the literature that we are teaching and promoting. This book was hard to put down. I would read a few chapters aloud every night to my son, but then he would read on after I left. This meant that I would have to quickly catch up the next day! Think Charlie and the Chocolate Factory meets The Westing Game. 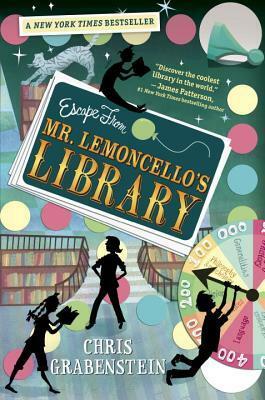 This book would be a great recommendation for reluctant readers. This informational text was highly recommend by my friends on Goodreads. Moonbird is that rare book that entertains as much as it informs. The author chronicles one breeding cycle of a red rufa knot, B95. 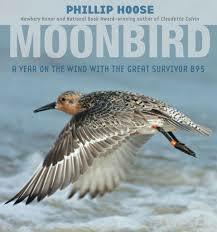 He is the oldest known shorebird of his species. The challenges B95 faces, both natural and manmade, bring a lot of suspense to the topic. I found myself cheering for the researchers who kept persisting in their inquiries about why the red rufa knot’s numbers are dwindling. It could serve by itself as the primary resource for a unit of study. You have got geography, history, environmental science, biology…and that is just the content areas. My son started reading these books and was constantly giggling. I had to find out what was so funny. A misfit (Dwight) finds his niche when he decides to fashion a paper finger puppet that resembles Yoda. 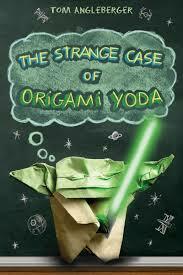 He then dispenses sage advice to his peers through this origami puppet in Yoda language. Or is it Dwight? The main character, Tommy, struggles with this question, as to whether Origami Yoda is actually real and not just a channel for Dwight’s imagination and his desire to be accepted. Beyond the humor, this book actually has a lot of heart. You can see the characters develop over the course of the book. Themes such as bullying, tolerance, and courage run throughout the story without coming across as preachy. I actually think this would make a terrific read aloud, with the help of a document camera to highlight all the doodles and comments in the margins. It would also serve well as a mentor text when teaching perspective. This story, about a toy rabbit who travels between different owners through a lifetime, will make for a good read aloud in the intermediate classroom. 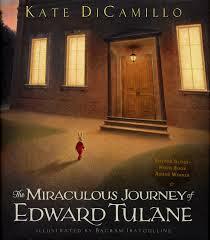 In fact, it is one of the choices for The Global Read Aloud. The themes of loss and love are pretty deep and will require some extended discussions. I still plan on reading the middle level books I had initially listed before the summer. But I have learned that while we should pick the books we want to read next, sometimes the books pick us. Inspired by Regie Routman’s most recent post about what she’s reading, I thought I would do the same on my blog. Below are the books I read in 2013. I am sure I read a few more than what was listed here, but I was too busy reading to post them on Goodreads! Some of these titles are rereads, noted with an *. These books deserved another read because they had more to offer than one round would provide. Humanity is sequestered to a silo underground, due to some event that made the surface of Earth uninhabitable. How the remaining members of civilization live and interact in this alternative world makes for a fascinating read. I have read the first two installments and plan to read the final book soon. If you investigate the back story on this series, you will discover the author self-published his writing online as a short story, in order to sustain ownership and to get feedback on how the story should proceed. Using his fans’ input, he crafted the rest of the Wool series, which then lead to a larger book deal. Is this the future of writing? If excellent science fiction like Wool is the result, I wouldn’t mind. This resource should be in the home of every young family. Some hospitals hand this book to new mothers and fathers after delivery. Whenever a parent asks me about what they can do to help their child become a reader, my response is usually, “Read aloud to them, every day.” My school received a grant to promote reading aloud with our families. We will be hosting a book study on The Read Aloud Handbook with parents starting in January, along with putting up Little Free Libraries in our community. Look for a post on the Nerdy Book Club blog on January 4th to learn more about this essential title. Although I did not read both titles at the same time, I believe they would work well together if someone were studying education in the age of technology and globalization. In The Smartest Kids, Amanda Ripley follows three U.S. students as they participate in foreign exchange programs in South Korea, Finland, and Poland. That all three score higher than the U.S. on the PISA, an internationally-based standardized test, is no accident. This piece of investigative journalism gives the audience an anecdotal perspective of the difference between the U.S. educational system and these three countries. Although I felt the author gave too much credence to one assessment, she does make a compelling case that the U.S. does need to ramp up our expectations for students’ learning, especially in mathematics. Ripley also showcases the greater amount of respect other countries have for the teaching profession. Where their two philosophies converge is the belief that U.S. schools can do better. Whether it is through better teacher preparation programs, or through professional development focused on student interests and project-based learning, both authors believe life long learning and high expectations are the key to our country’s future success. Any thoughts on the titles and perspectives I share? What books did you thoroughly enjoy this year? What’s on your to-read pile for 2014? Please share in the comments. About a month ago I had the honor of writing a guest post for the Nerdy Book Club blog. The title was Top Ten Tips for Reading Aloud. It was just one of many topics that are posted on this excellent literacy site. In the comments I had a great question from another educator: What recommendations do you have for secondary administrators? Below is his question and my response. How would you add to this conversation? Please share in the comments. It’s encouraging to hear that an administrator GETS it and can be seen as a literacy leader–not just a disciplinarian– in his building. Great ideas in this post. Do you have any recommendations foe middle school principals? David, I have given some thought in the past about that, being a former middle school AP. One idea is to share a relevant and engaging news article about a two-sided issue with a classroom. Then, after reading the article, open up a debate by doing a value line up and have the students pick a position and verbally support it (Checking for Understanding, Fisher and Frey). As we know, adolescents love to argue, and this formative assessment technique gives them the perfect forum to do that in a constructive way. Another suggestion would be to pick an excellent piece of student writing and read it aloud to a classroom. It can be anonymous, or you could get permission from the author. After reading it aloud on a document camera, instead for giving your initial opinion and praise, have the students assess it on their own using a writing rubric. Then have each student get together with another student and share their results with each other to try to reach consensus. If the discussion is strong, have pairs pair up and follow the same process. At the end, groups share with the class how they assessed it and why. This is the “Think-Pair-Share” formative assessment, also from Checking for Understanding. One final thought is just get into a classroom and read aloud a great novel. There is a misconception out there that just because older kids can now read means they don’t like or benefit from listening to a story read aloud. If you need a recommendation, I suggest Avi’s Wolf Rider. It’s a murder mystery/thriller, and it starts with the perpetrator calling the main character to tell him he killed someone. You will have the kids’ attention immediately and they will be asking when you are coming back next. Thank you for taking the time to write a “whole new post.” I am constantly reading aloud to my 6th grade students. (Every teacher knows that the best praise he can get is, “The book was boring when the sub read it yesterday. You do it so much better!”) I know my principal has TONS on his plate and that making time to push in to a classroom is a challenge. Still, I feel that it is worthwhile and would help establish him as a literacy leader in the building, give a chance for the students to connect with him and vice-versa, and influence the culture of the school. I guess me offering an invitation would be a good start. This is just one of many quotes from Mem Fox’s webpage titled Ten Read-Aloud Commandments. She is the author of several children’s books as well as Reading Magic, a guide for teachers and parents about reading aloud to kids. Mem Fox has several great resources on her website, include audio clips of some of her stories as well as resources for both parents and teachers. It is definitely worth a visit. This quote also reminds me of when my son came into this world six years ago. Still teaching at the time, I was very aware of how important it was to read aloud to kids, regardless of age. I immediately planned to apply this same philosophy with my new family. One of the first books I purchased for my son was Your Favorite Seuss: A Baker’s Dozen By The One and Only Dr. Seuss. Once we got home from the hospital, I spent a lot of my time reading and rereading these stories to him. I know he didn’t understand the words, but I think just hearing my voice started to create a bond between the two of us. I also enjoyed reading aloud poems from Where the Sidewalk Ends by Shel Silverstein. Both of these anthologies are still in his book collection in his room. Once my son got older and started to respond to what I was reading to him, we discovered lots of board books that he enjoyed. Some of his favorites included If You Were My Bunny by Kate McMullan, Guess How Much I Love You by Sam McBratney and Goodnight Moon by Margaret Wise Brown. I still laugh when I remember how my son used to try and “pinch” the mouse with his fingers in Goodnight Moon, thinking the illustration was real. Once my wife went back to her classroom, I took some time as well to be home with our new addition. We read Mama’s Home by Paul Vos Benkowski every day while we waited for my wife to pull into the driveway. Two years later, my daughter joined our family. Nothing changed in our routine of reading aloud every day to our kids. Many of the same stories my son enjoyed as a toddler my daughter enjoyed too. When the books at home became memorized from the repeated readings, we started making more frequent visits to our public library. The kids observed how we went about the collections and selected books. Pretty soon they were following our lead. Now they are the ones that lead the way through the library. I come from a privileged background. I grew up around books. I have received lots of information about teaching and reading, in both my post-secondary education and in my later trainings. As a principal, I feel it is my obligation to share this knowledge with everyone I come across. A thousand stories – have I read this many to my children yet? I think so, but I had a head start. It is never too late to start sharing great literature with your kids. What are you waiting for? They are only young once.